Brian Krische and his roommate had a lot of their Netflix discs go missing before they received them, and they grew suspicious. So, like any self-respecting and enterprising geeks, they set up a motion-sensing camera pointed at their mailbox. The results? 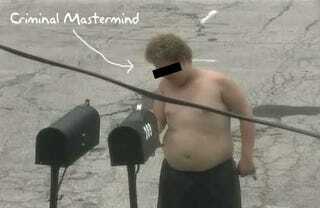 One chubby, shirtless criminal caught red-handed.